This Hampton Bay 4' LED ceiling light features a high quality, low-profile design that is perfect for kitchens, laundry rooms, offices, garages and basements. The frosted white acrylic lens distributes light evenly. And, unlike many large linear light fixtures, the lightweight construction makes for easy installation, while the LED technology ensures long-lasting, energy-efficient lighting. This ENERGY STAR certified and cUL rated dimmable fixture produces 3000 lumens of bright white light (4000k Correlated Color Temperature). 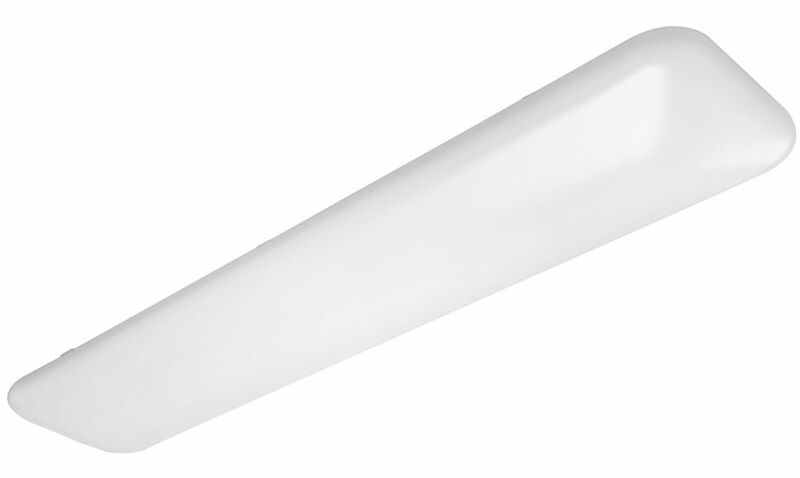 This LED linear light fixture consumes 37% less electricity than a fluorescent fixture would require it uses only 40 watts of input power versus 64 watts for two 32-watt fluorescent tubes. Plus, with its integrated LED design, there are no bulbs to replace like with fluorescent alternatives! Lasts 45.6 years based on an average of 3 hours daily use or 50,000 hours of continuous use - no bulbs to replace! Frosted glass inner shade with outer brushed nickel finish frame. Oversized ceiling plate attachment makes this flushmount easily fit over existing ceiling openings. Unscrew bottom finial cap on frosted glass light diffuser to clean or replace bulbs. Closed top lantern with scalloped window frame and water glass sends long shadow reflections across porch and landscape areas. Made of weather resistant cast aluminum. Open bottom flushmount fixture provides clear light over grounds and deck area. Wagon wheel frame is a perfect match for country home or garden areas. Place indoors for an outside look in hallway or entry area. Rustic outdoor ceiling flush fixture. Web frame helps prevent glass breakage. Made of weather resistant cast aluminum. Globe Electric's Aline 11In Brushed Steel Flush Mount Light Fixture brings an elegant and traditional look to any room. Fully dimmable with a compatible dimmer switch you can create the desired mood for any situation. Ideal for use in basements, bathrooms, bedrooms, dining rooms, entryways, hallways, kitchens, living rooms and more this ceiling light is a perfect way to update your space. Includes all mounting hardware for quick and easy installation and requires 1x E26 Type A bulb (sold separately). Led Linear Ceiling Light - 4 Foot - ENERGY STAR® This Hampton Bay 4' LED ceiling light features a high quality, low-profile design that is perfect for kitchens, laundry rooms, offices, garages and basements. The frosted white acrylic lens distributes light evenly. And, unlike many large linear light fixtures, the lightweight construction makes for easy installation, while the LED technology ensures long-lasting, energy-efficient lighting. This ENERGY STAR certified and cUL rated dimmable fixture produces 3000 lumens of bright white light (4000k Correlated Color Temperature). This LED linear light fixture consumes 37% less electricity than a fluorescent fixture would require it uses only 40 watts of input power versus 64 watts for two 32-watt fluorescent tubes. Plus, with its integrated LED design, there are no bulbs to replace like with fluorescent alternatives! Led Linear Ceiling Light - 4 Foot - ENERGY STAR® is rated 4.0 out of 5 by 5. Rated 5 out of 5 by Karen from Efficient and cost reducing This light was purchased to replace a 4 foot fluorescent light and we are completely happy with the fixture. Fixture is bright, clean and definitely less expensive to operate. Rated 4 out of 5 by MissMiss from The lighting is a vast improvement We have had the lights installed about two weeks. They are a vast improvement over the old fluorescent lights. Rated 1 out of 5 by CCSS from You don't get what you see It's the second time I bought this product. Recently I have it installed by the contractor who did the upgrade for my new apartment. I noticed it yesterday that the width of the case was smaller than what it should be by 2". I went back to the shop last evening and confirmed by the staff that the width of the one displayed was 12" but the one they are selling in the box is 10" !!!!!!!!!!!!!!!! Rated 5 out of 5 by uptowngirl from Bright light for a senior Purchase this light as a replacement for a fluorescent light in my 87 year old mother's kitchen as a Christmas present It was only installed last week but she loves it and it looks great She like the bright white light and she can sew, quilt and put puzzles together in the great lighting She also like the idea of never having to replace bulbs Bonus it only took my brother 30 minutes to install. Rated 5 out of 5 by tiger eyes from Excellent lighting Bought about a month ago and installed it myself. The connecting wires are a little long, so I had to tape them in place on the frame so they would not cast a shadow through the cover. Easy to install alone because it is so light. Is this light fixture dimmable? Can I purchase a replacement lens for this product?